The Mackenzie poltergeist case; All the details! IT MUST have seemed like a good idea at the time. The homeless man was without a bed and the night was chilly. When he found the door to the mausoleum open it could have looked inviting but quite why he decided to open a coffin and snuggle down beside the skeleton is less easy to explain. He may have been fine had the entire coffin not crumbled on top of him, showering him with the dust of a 400-year-old corpse. He let out a rather loud scream, which was heard by a passing dog-walker, who let out an even louder scream when he saw what looked like a zombie coming straight for him. There followed a Scooby-doo moment when they, and the dog, ran around the graveyard screaming before running off in opposite directions. 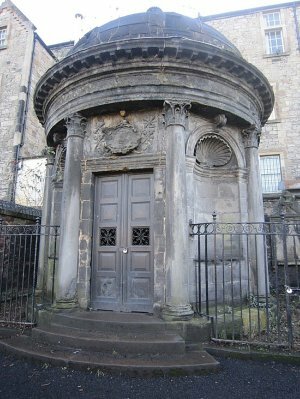 What neither the homeless man nor the dog-walker realised was that the mausoleum belonged to one of the most monstrous residents of the graveyard of Greyfriars Kirk: the 17th century Judge and Lord Advocate Sir George Mackenzie, otherwise known as "Bluidy Mackenzie", who executed a large number of Covenanters. The Covenanters were a powerful political force in Scotland in the 17th century. On 28, 1638, a large gathering signed the "National Covenant" in Greyfriars Kirkyard, pledging to keep Scotland a Presbyterian country. This document formed the basis of a treaty whereby the Scottish government would support the parliamentarians in the English Civil War. However, 50 years later Charles II was on the throne, the Covenanters had been outlawed and they were heavily defeated by the king's forces at the battle of Bothwell Brig. In all, 18,000 Covenanters died for their beliefs, 1,200 were imprisoned in the Covenanters Prison in Greyfriars Kirkyard by Mackenzie. Some were executed and their heads displayed around the prison walls. The rest were corralled in the yard and left without food or water. Hundreds died, and for some the last face they would have seen was the mocking, jubilant and hateful face of "bluidy" Mackenzie. Poltergeist theory would claim that the disturbance of Mackenzie’s coffin was the trigger that awoke the ghost and now it haunts the Black Mausoleum, Mackenzie's last resting place. Soon stories of blackouts, attacks and spooky goings-on abounded. It all became too much for Edinburgh City Council. They locked the door, threw away the key and declare the area out of bounds (for the living anyway). Jan-Andrew Henderson lived in a flat over-looking the graveyard. He was amused by the stories of haunting and puzzled by the council’s decision. Not slow to spot a business opportunity, Mr Henderson, who runs ghost tours of the old city, asked the council for permission to bring tours to the mausoleum. And that is when things really began to escalate as Jan explains: "I am a very scientific person, and I don’t know if I believe in ghosts or not," Mr Henderson says "but I just don’t have an explanation for the sheer number of people who have collapsed, had their fingers broken or whatever. I’ve even had phone calls from two people who say their partner has now been committed, and blame it on the ghost." I just don’t have an explanation for the sheer number of people who have collapsed, had fingers broken or whateverSince 1999 there have been 350 documented attacks. 170 people have collapsed. Tourists have reported hot spots, cold spots, somewhere in the middle spots. They have been bloodied and bruised, pushed and pulled, by an unseen and altogether unwanted visitor to the Black Mausoleum. Mr Henderson tries hard to keep an open mind, and maintains that until he himself is hurt by the "thing", he refuses to believe in it. But he has not gone unscathed. "There is a lot of so-called poltergeist activity associated with the area, fires, loads and loads of dead animals that can’t be explained, that kind of thing. Holy hell, the thing even burnt down my own house! All my papers and notes about the Mackenzie poltergeist were destroyed."